Here we are, although how exactly we got here I'm not sure, looking down the last week of June. Does that make me a bit sad? Yes, but you know what helps to counter that? 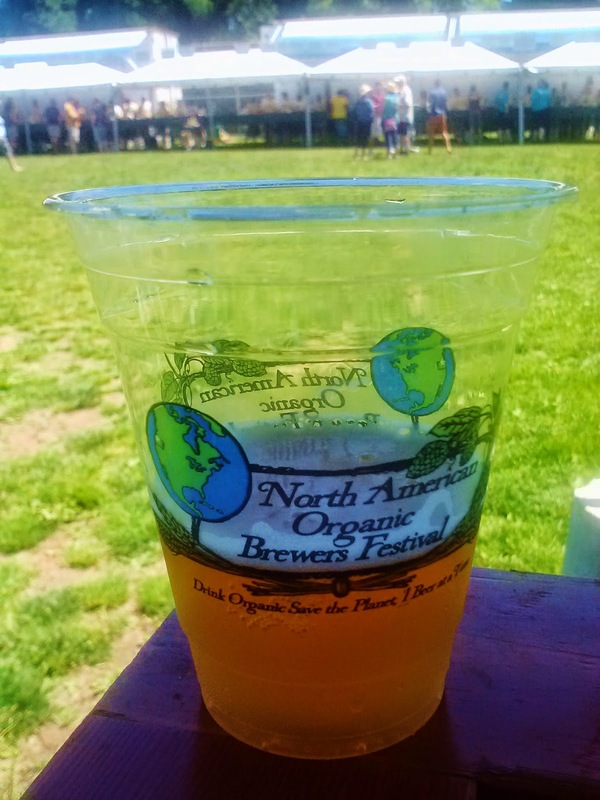 It's time for the North American Organic Brewers Festival (NAOBF)! NAOBF, sandwiched between Fruit Beer Festival (whose beer line up is the one I look forward to most) and OBF (whose sheer depth and breadth is amazing), is special in another way. It takes place at my favorite beer festival venue in Portland - Overlook Park. Getting back to my standard beer festival preparations (which I've been slacking on a bit lately) I scanned the beer list looking for beers that I've had, ones I can cross off my drinking list for the day (because as much as I'd like to drink them all, even I'm not that good). To my surprise and dismay, I wasn't even able to rule out half of the nearly 60 offerings. Then it was time for round two cuts. Reading through the beer descriptions I was looking for special words like "dry-hopped" and "tart" and interesting ingredients like "cold brewed Jasmine tea" and "ginger". That round made a more significant impact, whittling the list down to 10 beers I definitely want to try and handful of others I'd like to try, a manageable agenda for day drinking. The final step, and this is a newer one, will be to add the 10 - 15 beers to my Untappd wish list. Not only will it make check-ins easier at the festival but I'll be making progress on the elusive Your Wish Came True badge. Yes, I'm that kind of beer geek. Wanna be Untappd friends? Summer officially starts tomorrow (at a time that most of us would consider ungodly early) and with that we'll probably be spending more time outside, perhaps looking for a more summery beer to drink or share with friends. 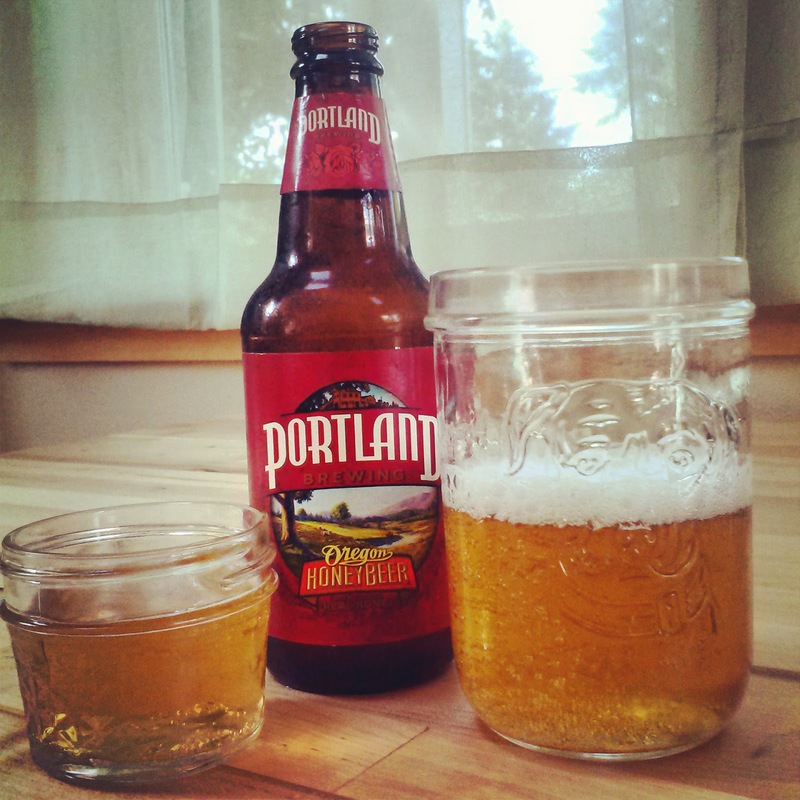 Portland Brewing's summer seasonal, Oregon Honey Beer, might just be what the beer for that. My first taste of the beer came recently on a beautiful, warm evening in Portland, a perfect preview of the summer evenings ahead. Besides having honey in the name, it was present in both the aroma and flavor. None of that artificial honey flavor either; the mild white clover honey that was used came through as cleanly as if I had dipped my spoon into one of the jars on my shelf. Additionally, Portland Brewing used just the right amount of it so as not to create a beer that was overly sweet. Instead what they have crafted an easy drinking beer. While the initial sips provided a bit more lager characteristic hanging on the back end than I prefer, it wasn't enough to keep me from wanting to drink more. As the beer warmed the lager aftertaste faded and the beer became even more drinkable and pleasant. This is one I'd happily stock in my fridge, both to enjoy on my own and to share with friends who have a wide range of palates. Perhaps you'll give it a try the next time you see it on tap or at the store. 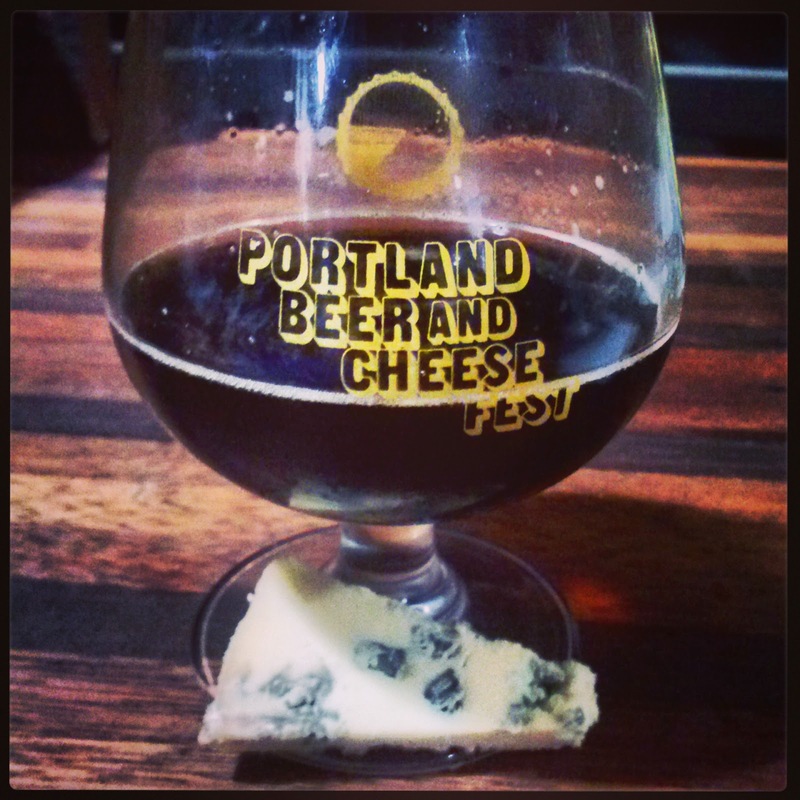 Beer & Cheese - Yes, Please! 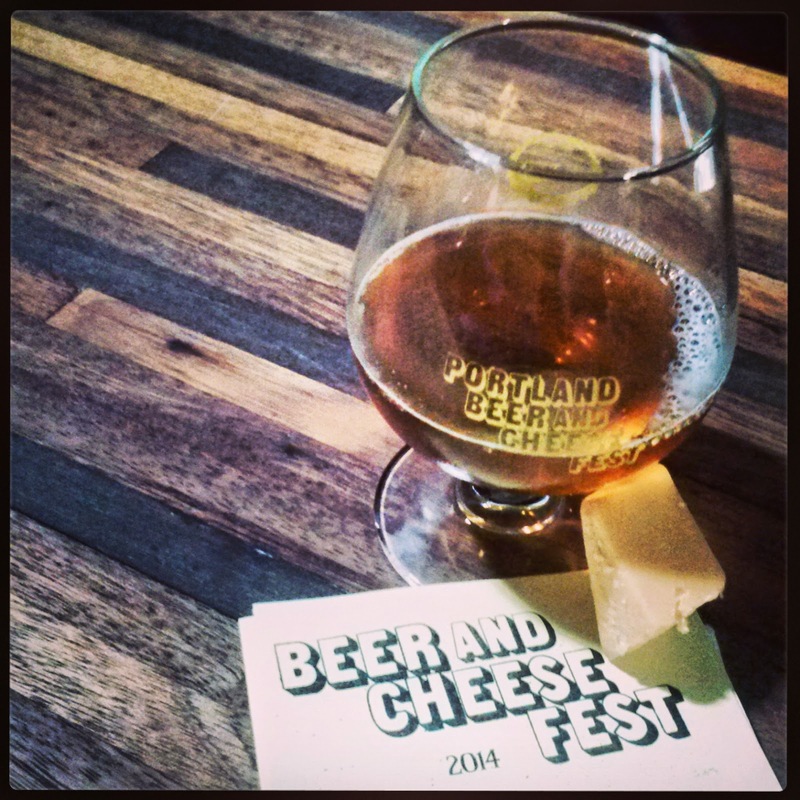 The 10-day run of PDX Beer Week concluded on Sunday and one of the last events was one of my favorites - the Beer and Cheese Fest. We attended the first year and it was great! I missed out last year due to my indecisiveness; tickets sold out and I regretted not being able to attend. This year as soon as I heard tickets were on sale I made the decision that I would be going. As the event approached I was looking forward to being unexpectedly delighted by pairings containing beers I don't generally like on their own. Of course I was also looking forward to finding that decedent, delicious favorite that was sure to be somewhere in the bunch. Held at The Commons Brewery for the two last years, the event temporarily moved to Burnside Brewing this year. Although not as aestetically pleasing of a location the beer and cheese (and complimentary charcuterie from Olympic Provisions) were just as tasty. Steve Jones, owner of Cheese Bar, curated the pairings, and his talent, if not evidenced enough by the awards he's won, was displayed once again at this event. Of the 11 pairings there was only one I felt was slightly off the mark; the rest were very enjoyable. Further adding to evidence of his talents, the majority of the pairings contained a beer I didn't find enjoyable on its own. The pairings I enjoyed the most had one similarity: the beers they contained all fell on the dark end of the color spectrum. It's hard to pick a single favorite, so I give you my top four. This is a cheese I hadn't had before but the creaminess (similar to a nice Brie) and the saltiness hit all the right notes for me. The Dunkelweiss is not a style I generally like and although I enjoy Commons beers this is not one I'll be ordering on its own. Together though they were magic. The beer is a big, chocolately porter and while the cheddar was mild it had enough of a back bite to stand up to the beer. The effect was that of putting salty cream in dark, cold hot chocolate. This was the pairing I was most excited about and it didn't disappoint. The beer gave off a robust bourbon aroma that followed through in the flavor but not to the extent of being overpowering. As for the cheese, I'm a sucker for blues, especially salty, cream ones like this and I could have eaten portions of this pairing until I burst. I've had and enjoyed the beer before so that half of the pairing was a slam dunk. The aroma was that of coffee creme brulee with a pleasantly slightly burnt flavor. The creaminess of the cheese continued the creme brulee-ness of the pairing. 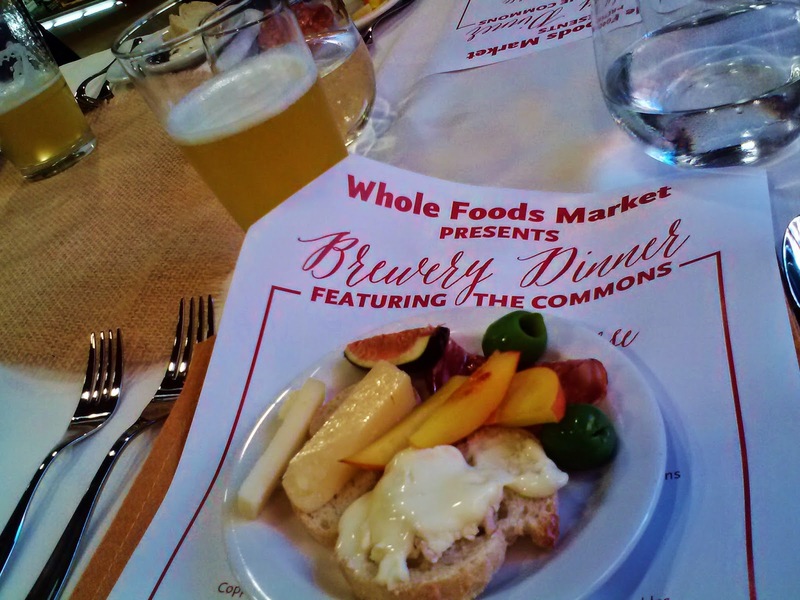 When a last minute opportunity presented itself for me to attend the Whole Foods Market Brewery Dinner it was an offer I couldn't refuse, in large part because the brewery partner was one of my favorites - The Commons. Additionally I was intrigued to see that Whole Foods was dipping their toes in the beer pairing dinner waters. 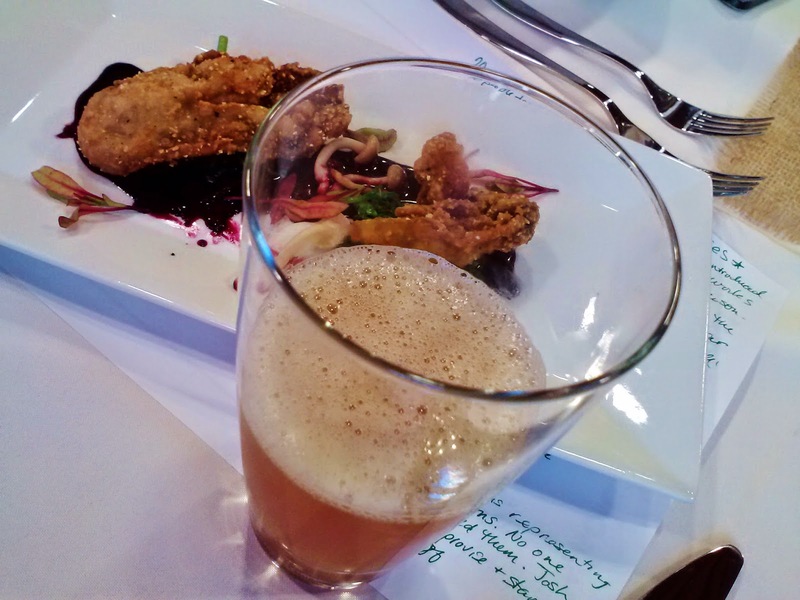 The dinner was held at the downtown location, upstairs in The Salud. Part of it overlooks the store and part of it overlooks 12th Avenue, a bright and airy space that seems much bigger than it is. While it's set up with those fancy, tilted mirrors for cooking demonstrations the night's focus was what was right in front of us on the table. Josh and Travis were on hand representing The Commons and after a brief introduction we dove right into the introductory course of two cheeses, baguette, olives, fresh figs and nectarines. Paired with it was The Commons Saison. While Harbison, the softer of the two cheeses immediately won my heart over it was the firmer goat cheese, reminiscent of a parmesan, which I thought paired better with the beer (also delicious with the bright green olives). The appetizer course was something I was reserved about as I prefer my oysters raw, but I was pleasantly surprised to find these cornmeal-crusted oysters cooked perfectly, retaining their juicy delicateness. The sweet and sour beet emulsion gave the plate a vibrant burst of color and was a visual compliment to the flavors of Flemish Kiss, the pairing for the course. The oysters and the beer were delicious together although the wilted greens the oysters were served atop seemed to clash with the beer. On to the entrée, a Copper River salmon fillet paired with Fleur de Blanc. 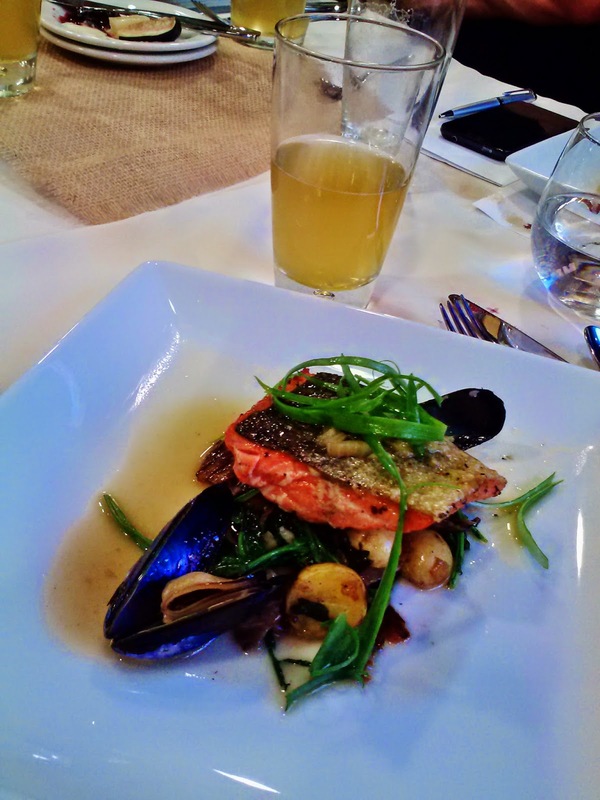 The salmon, mussels and veggies accompanying it and the beer were all very bright and light and just plain rocked together. I'd go so far as to say that Mag, who isn't a big fish fan, would have really enjoyed by this pairing as well. 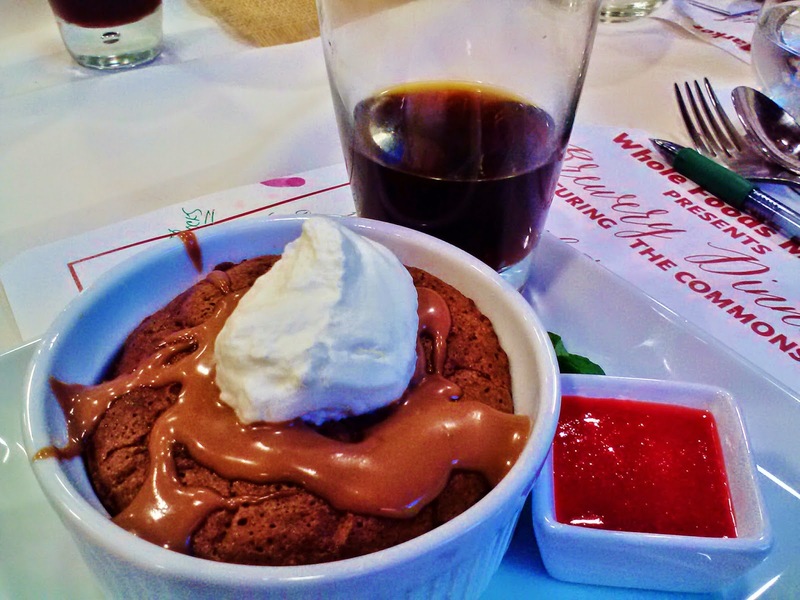 To finish out the event we were presented with a generous portion of chocolate soufflé cake and 2014 Brotherly Love. The dark chocolate flavor of the cake was a perfect complement to the beer, a Belgian Dark Strong ale aged in Bourbon barrels with NW grown sour cherries and Ecuadorian cacao nibs, and my favorite pairing of the night. The whipped cream and berries that the cake was served with were good but unnecessary. 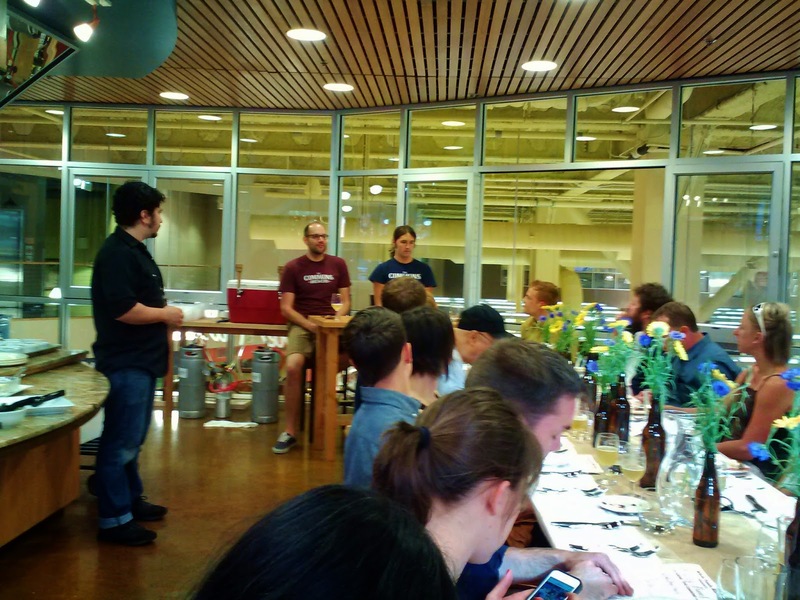 Thanks to The Commons and Whole Foods Market for a delightful evening of tasty treats! 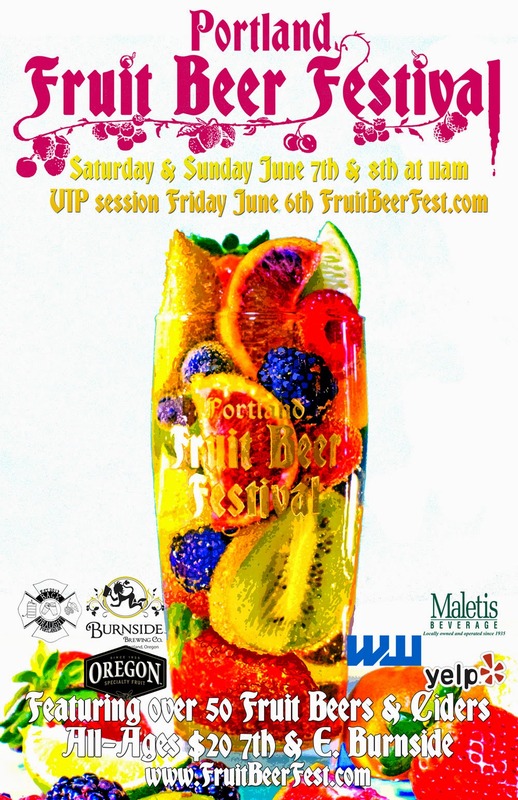 PDX Beer Week starts today and one of the events I'm looking forward to the most is the Fruit Beer Festival. We went the first two years but were out of town for it last year (in our defense, we were on a beer trip in Colorado). I recently had the opportunity to sample nine of the beers that will be at this year's festival and while I enjoyed all of them there were three that really made me smile. This sour ale goes beyond just fruity, venturing into the land of spice with the addition of one pound each of juniper berries and pink peppercorns during brewing and habanero syrup at the end. The small group of us that were chatting as we sampled each beer agreed that the first sip is like Squirt soda. Not a bad thing, especially considering it's a 3.2% beer. Assistant brewer Jason Barbie used lactobacillus to sour it and while I don't know if I've had any of his creations before I'll certainly be on the lookout after the bang up job he did on this. Laurelwood Orange You Glad I Didn't Say Banana? I have to admit that the name had me a little scared with the mere mention of banana. Boy was I wrong! Starting off with a great aroma, this is a tart wheat that uses a Belgian wit yeast strain and required 600 lbs of citrus fruits to be processed for their zest and juice that were added post fermentation. As for the name, Brewmaster Vasili Gletos, said that they had been making hefeweizens for a few months and he has a five year old son with which Knock, Knock jokes are very popular. I wasn't surprised to find that one of my favorite beers of the tasting came from one of my favorite breweries. Citrus Royale is a take on Biere Royale (another delicious beer), using the same base with spelt and flaked wheat and soured with Nancy's yogurt. It's tart, fruity and overall delightful! If you haven't been to the Fruit Beer Festival before it's well worth going, even if you don't think you're a fruit beer fan. Fruit doesn't = sweet and isn't bound by the use of typical base beers. In the tasting alone there was a Belgian Dark Golden and a Grapefruit White IPA; I expect that our talented and creative brewers will surprise you with all kinds of creations at this festival. 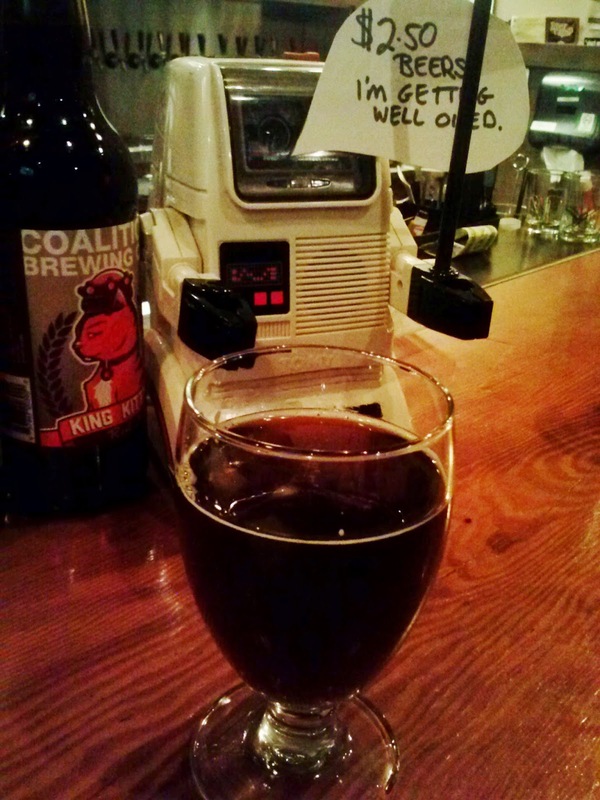 When we moved to Portland four years ago Coalition Brewing was one of the first places we found. From the get-go it felt comfortable and homey, in large part due to the staff, and their Two Dogs IPA and King Kitty Red have been long standing favorites. At the time we were living near Reed College but we visited fairly frequently. Last year we moved so that we're now a mere 10 blocks away. In between we got to know Elan, Kiley and the rest of the staff well, always being greeted and treated with the same welcoming style that first hooked us. In addition we volunteered during one of the Sunday Parkways events and I've had multiple good times in their brewery. They graciously allowed the LOLA/PBS ladies to brew on their small batch system and a few months ago I spent an afternoon zesting fruit for their newest IPA, Spacefruit. Coalition has also been the reason I met some people that today I hang out with frequently, from their Mighty Mites event to the Coalator program which introduced me to Lee's brewing greatness. Yesterday was not only the last day of May but also the last day for Coalition's pub. 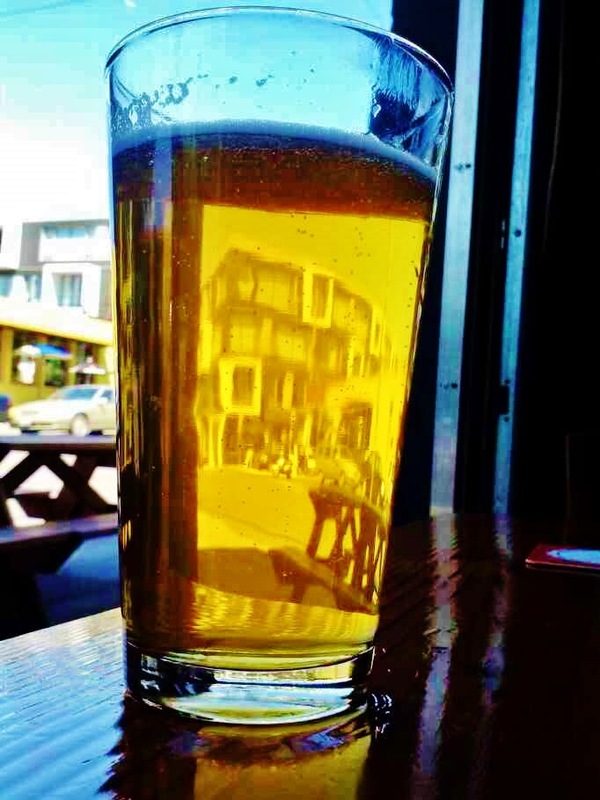 The brewery isn't closing, just the pub, and although I think this is going to be a great thing for the brewery (they'll be able to focus more on production) I'll certainly miss the pub. Thank you, Coalition pub, for the last four years! I look forward to the next stage and eventually, an even better pub.